Lenders look at a borrower’s credit score, number of open accounts, payment history, type of credit borrowed and a series of other factors when determining what level of risk to access to each lending scenario. Down payment requirements, loan programs, flexibility on income and even interest rates can be impacted by a slight bump in a credit score. A FICO score is between 300 and 850, exhibiting a left-skewed distribution with 60% of scores near the right between 650 and 799. Once credit has been established and maintained, credit scores are based on five factors to varying degrees: payment history (35%), total amounts owed (30%), length of time (15%), type of credit (10%) and new credit (10%). The largest impact on credit scores is payment history and amount owed, which is why it is important to pay bills on time. Debt should be kept to a minimum and funds should be moved around as little as possible. It may be beneficial to leave all accounts open, even if they have a $0 balance. 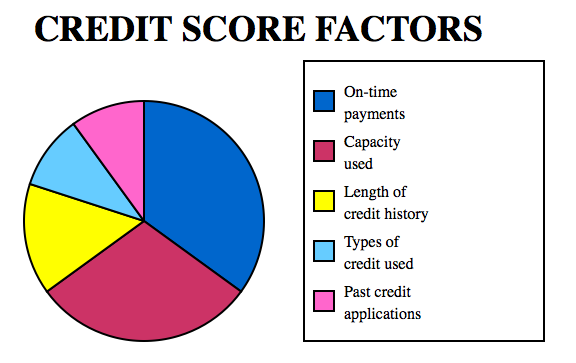 Different types of credit (ie. mix of credit cards, installment loans and fixed payments) can also be beneficial to a credit score. However, too many installment loans can negatively affect credit. Although time is a necessary factor for improving credit scores, this can be controlled by keeping the accounts that are opened during the same time period to a minimum. By following these guidelines over an extended period of time, credit scores can be maintained and improved in order to improve the borrower’s loan potential and interest rate. It is essential to pay your credit bills on time. Every 30 days late, collection, judgement, or Bankruptcy significantly drops your score. Easy rule-of-thumb – the longer your accounts are open, the more positive impact it will have on your overall credit score. In fact, if you happen to have a card that is over 10 years old with even a little activity, it would probably be a bad idea to close that card. Generally speaking, if you have closed loans, such as a car loan, as well as open credit cards, it helps prove to creditors that you have experience borrowing money. Several factors can be used to establish credit initially, including bank accounts, employment history, residence history and utility bills. Although they are not reported directly to credit bureaus, bank account history is important to lenders for first time loans and should be kept in good standing. While they are also not reported to credit bureaus, utility bills (such as electric, telephone, cable and water) can also show a lender the risk associated with a new borrower. Credit may be initially established through a bank with secure credit, in which a credit card is linked to a specific amount of money deposited in the bank. If the credit card is not kept in good standing, the bank can then take the secured funds for payment. Initial credit may also be established with a department store credit card (for example), but borrowers should beware of the high interest rates associated with these cards and pay off the balances in full. Always be sure that these credit sources are being reported to the credit bureaus.